It is about a shotgun to central percussion. The juxtaposed barrels are smooth, of gauge 12. Locks are of type “ahead”. 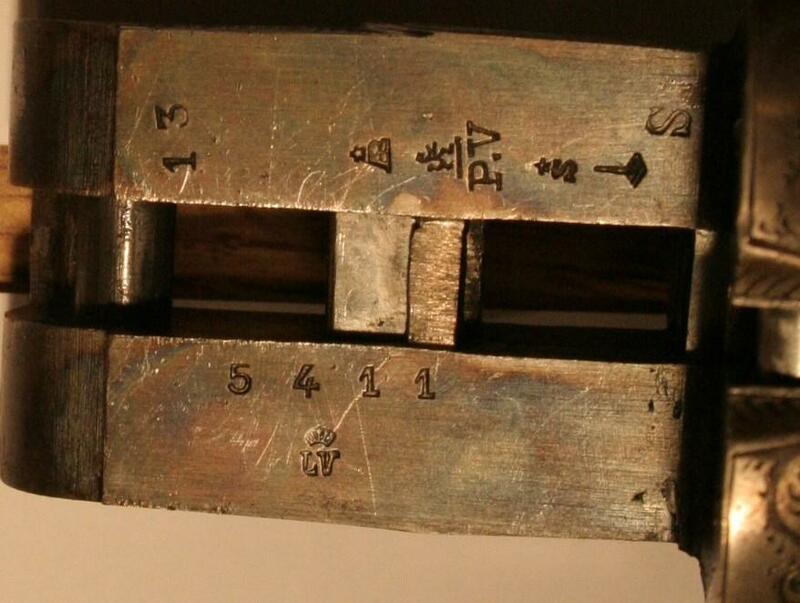 The hammers are external and the key of opening “Top Lever”. The forearm is with pedal-trough. Engraving is of style bouquets. The stick out of wooden of walnut is worked with English. ELG on star in a crowned oval: final acceptance post 1893. 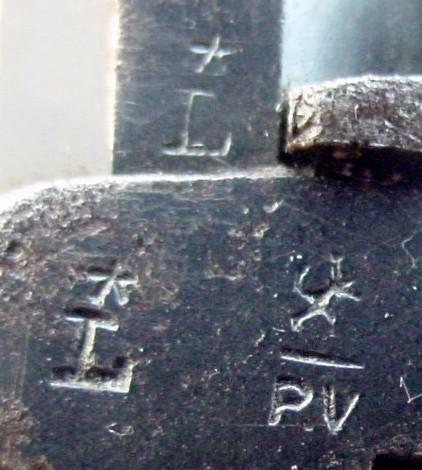 S, K and AB spangled: countermarks of the controllers post 1877. 12 C in a rhombus: gauge, of use of 1898 to 1924. 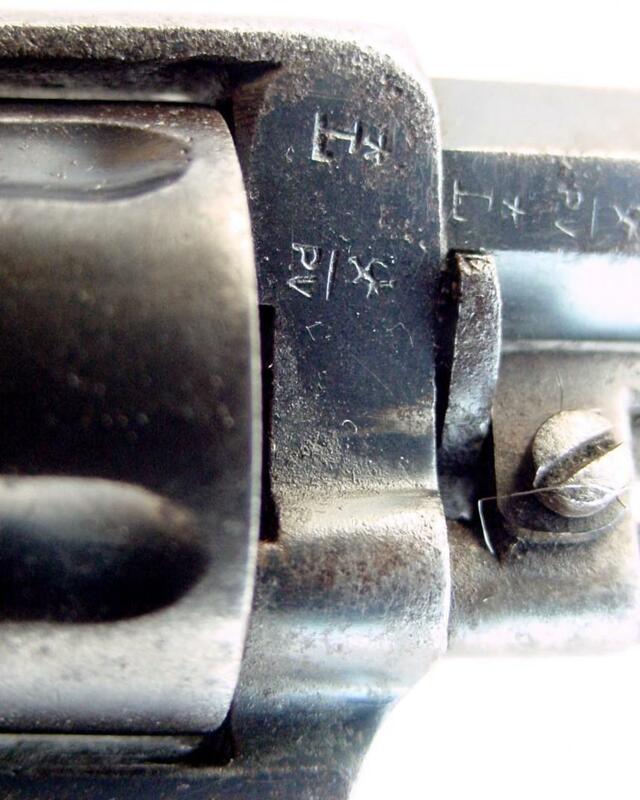 Choke 17.7/18.2 and 17.4/18.1: chokes barrels: calibre in mm to 22 cm of the breech and the mouth. In use of 1910 to 1924. EL in English letters: provisional test, of use of 1852 to our days. D = 20 mm/20.6: Length of the room in mm and diameter in mm after optional test with the powder without smoke. In use of 1892 to 1924. T.I and S: ignored significance? Markings of workshops?? Rue des Augustins, 26 Liège (16/05/1918) (1921-1932) (Ann.1924) (Ann.tél.1949). Rue Hayeneux, 217 Herstal (Ann.1959). Successors of Jules Kauffmann & Co.
N° 2215 – Liège 03/05/1918. N° 2216 – Liège 03/05/1918 transmission of the mark n° 538 du 22/09/1890. N° 2217 – Liège 13/05/1918 transmission of the mark n° 771 du 03/01/1896. N° 2218 – Liège 13/05/1918 transmission of the mark n° 794 du 06/10/1896. N° 2219 – Liège 13/05/1918 transmission of the mark n° 809 du 23/11/1896. N° 2220 – Liège 13/05/1918 transmission of the mark n° 810 du 23/11/1896. N° 2221 – Liège 13/05/1918 transmission of the mark n° 939 du 09/10/1899. N° 2222 – Liège 13/05/1918 transmission of the mark n° 957 du 29/11/1899. N° 2238 – Liège 16/05/1918 transmission of the mark n° 1877 du 08/08/1912. N° 2239 – Liège 16/05/1918 transmission of the mark n° 2110 du 22/07/1914. 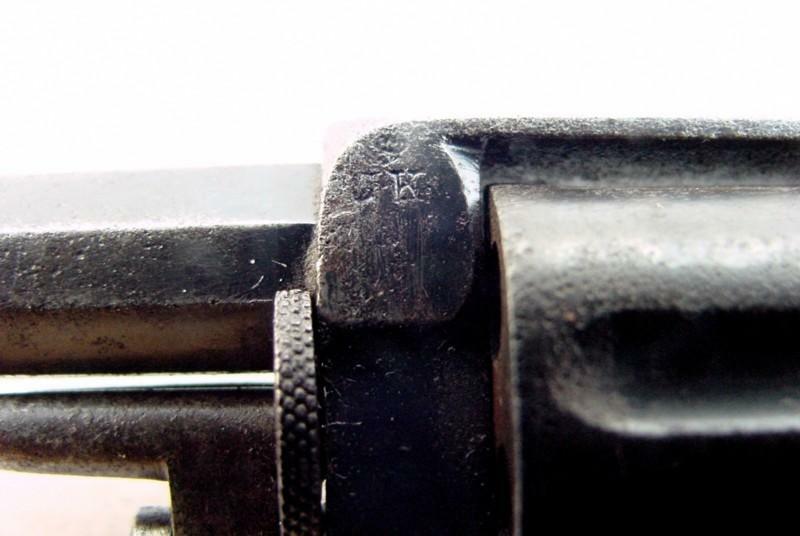 n° 294350 - 07/02/1921 Closure for rifle with rocker. n° 297875 - 30/07/1921 Fixing of the bottom of the store with cartridges for firearms. n° 297876 - 30/07/1921 Safety for automatic weapon. 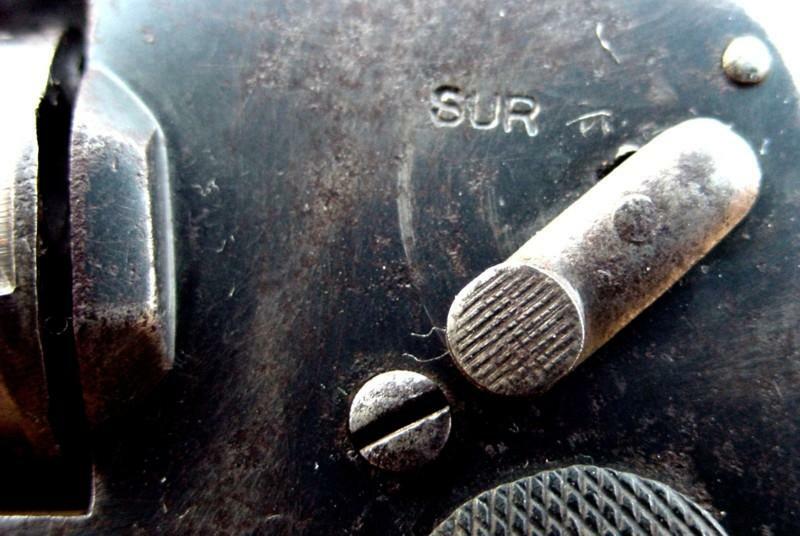 n° 298415 - 23/08/1921 Ejector for rifle with rocker. n° 388448 - 11/05/1932 Improvements for auto pistol. 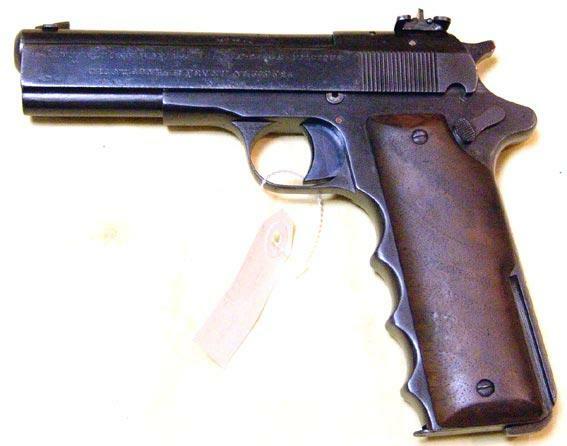 Note: the Belgian patent n° 305326 be reproduced on the automatic guns Lepage was deposited by COMMERCIAL Jules (street Nysten, 42 in Liege) on August 30, 1922. "Since 1790 one announces Lepage Manufacture and in 1810, at the time of the establishment of the bench of tests, Lepage syndic is named. The Revolution of 1830 makes it possible to the chief of the Lepage firm to affirm its patriotism at the same time as its industrial activity: the National Committee charges it with getting weapons with the army of the incipient country. It discharges this mission so well that in 1834 the Belgian government confers the iron cross to him for services announced to the cause of the Belgian Revolution. 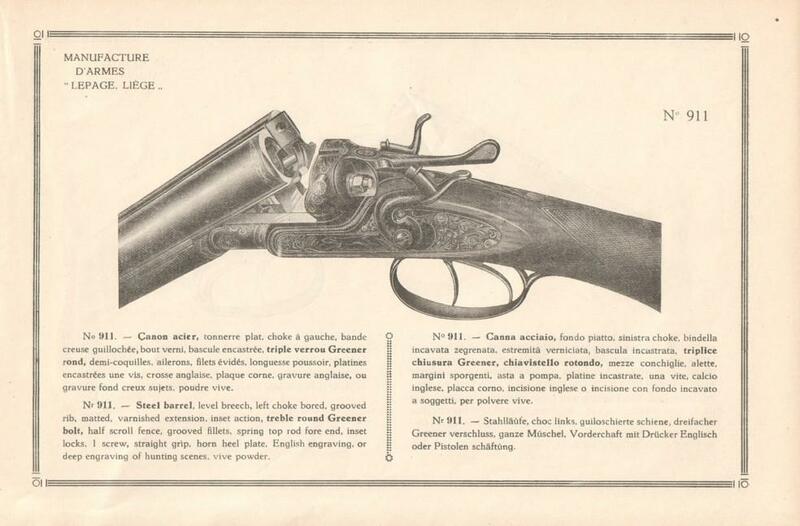 Little time before the war the 14-18 Lepage house had also specialized in the manufacture of revolvers and several governments had recourse to it to equip their navy or their army with irreproachable weapons. 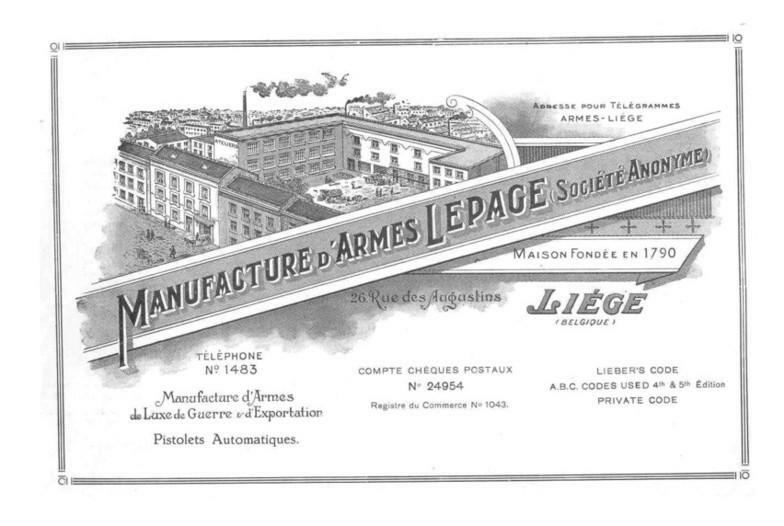 In 1918 the Lepage house, transformed into limited company "Manufacture d’armes Lepage" went back immediately to work and since 1919 made appreciate its products on the English and American markets. It associated a machine shop which it transformed into model factory provided with American machines of high precision. It manufactures there its automatic pistol for which it took the patents after seven years of study "
(According to a Lepage catalogue). Production of weapons (about 1926). Rifles with tilting barrels and hammers external - closings with double key, simple, double, triple and quadruple Greener bolt. Hammerless rifles - closings with double key, simple, double, triple and quadruple Greener bolt. Rifles express train with Purdey closing. 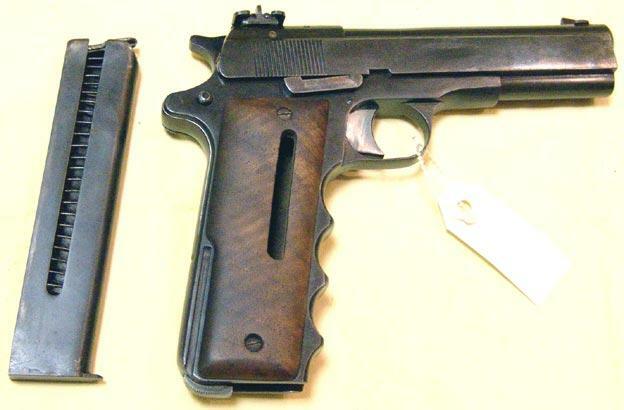 Semi-automatic pistols Lepage with 8 blows cal. 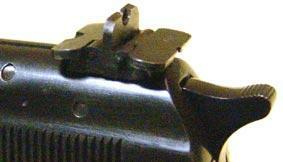 6,35 - 7,65 - 9 mm short and 9 mm long Browning. Lepage pistols 9 mm of war with 12 blows, with or without sheath. 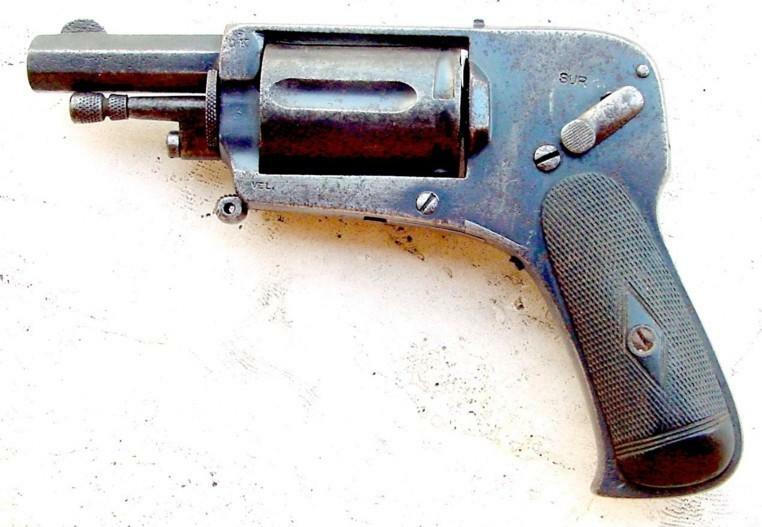 Revolvers with crack and central percussion cal.320 or 380. 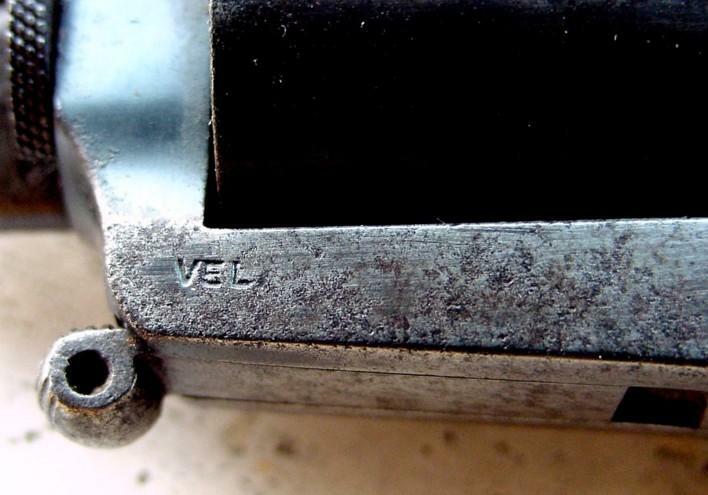 Vélodog revolvers without apparent hammer - folding trigger - with central or annular percussion. Single-barrelled riffles with central percussion Leclerc system with key snake. Rifles of living room with pull knob or system Remington cal. 6 and 9 mm Flobert. Collapsible rifles with two guns - Leclerc system with key snake cal.410 to 12. Rifles with 2 shots with pistons cal.12 to 20. 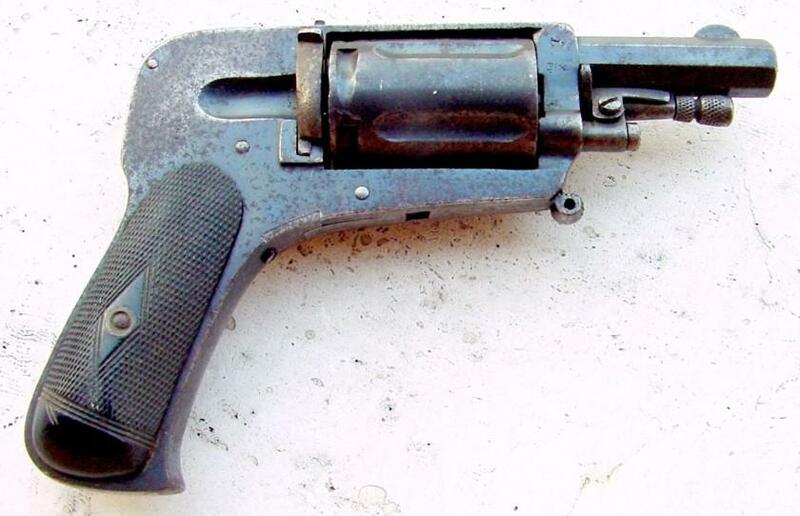 Pocket hammerless revolver, also more commonly called "Bossu" (UNEVEN), shoot cartridges with sharp powder of 8mm LEBEL. 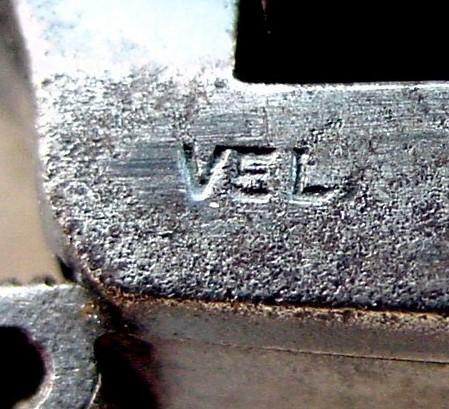 It could also be manufactured into 6,35 and 7,65 BROWNING and 5,8 VELODOG. R crowned: rifled bore - of use of 1894 to 1968. Lion surmounting PV : test with the powder without smoke – of use of 1898 to 1968. 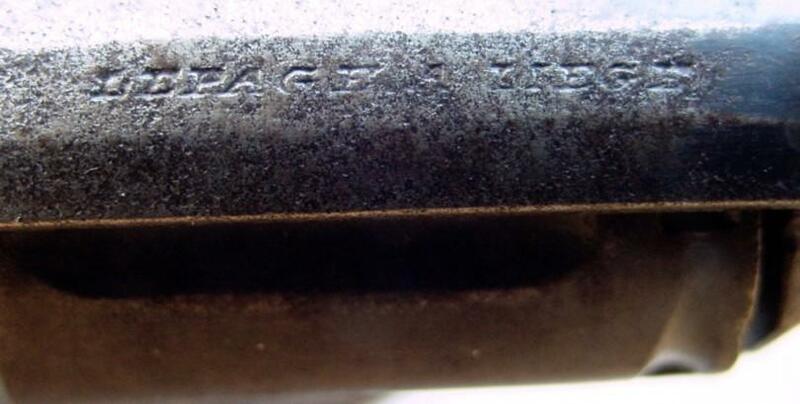 J spangled: countermark of the controller - of use of 1877 to 1968. 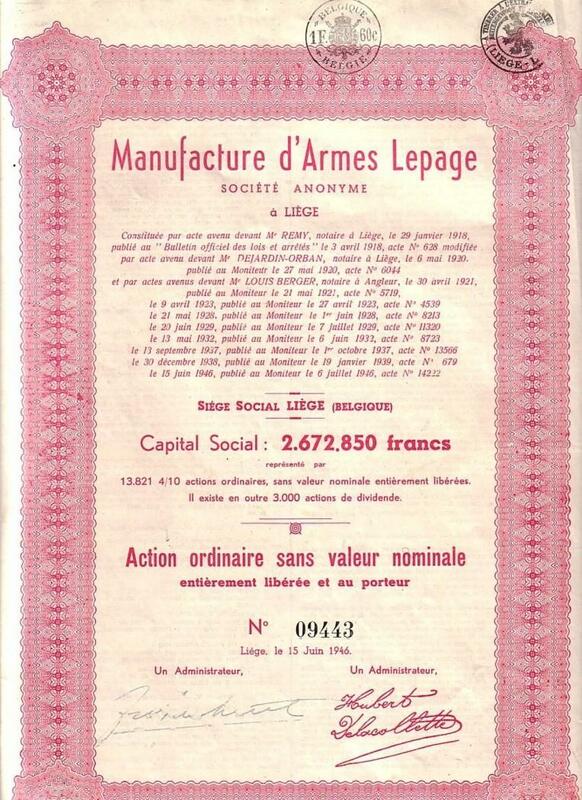 Manufacture d’armes LEPAGE street of Augustins, 26 in Liege – Proof house of Liege 1919/1961. 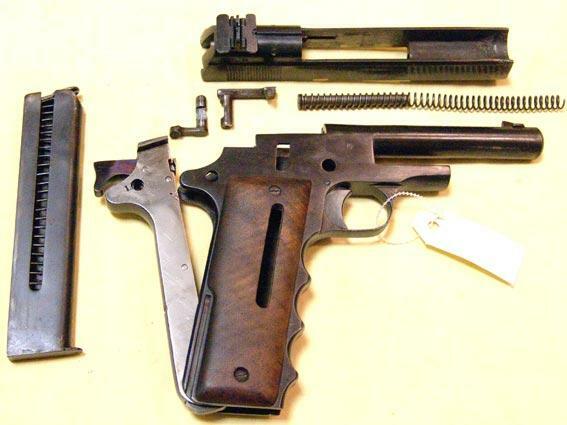 It acts of an automatic pistol Lepage (Liege) calibre 9mm long. The system is interesting: there is no bar of transfer between the trigger and the trigger plate, it is the magazine who does this work. The weapon is massive and was to be a "great capacity" at the time. Many thanks to the "Ets CORNET" for the nices pictures. Back to "LEPAGE AND KAUFMANN"